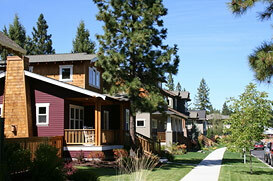 Set amidst ponderosa pines and rugged lava outcroppings on the west side of Bend, Oregon is NorthWest Crossing – an award-winning, diverse, residential, mixed-use real estate community. NorthWest Crossing offers a variety of home options, designs and sizes as well as two public schools, shops, cafés, parks, trails and more. The entire community was thoughtfully designed to make it easier for people to get to know each other. Discover NorthWest Crossing… where being a neighbor comes a little more naturally.